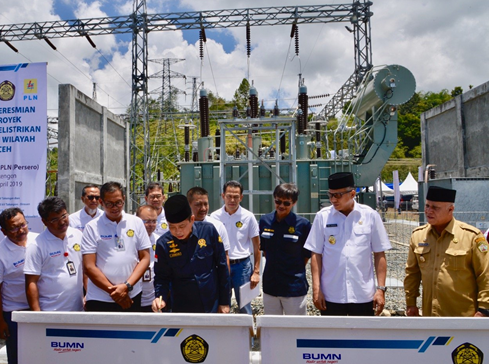 Minister of Energy and Mineral Resources (ESDM) Ignasius Jonan, today, Tuesday (9/4), inaugurated several electricity infrastructure projects in Provinces Aceh and North Sumatra, which were centered at the 150 kV Takengon Substation, Calo Blang Gele Village, Bebesen District, Central Aceh District, Aceh Province. 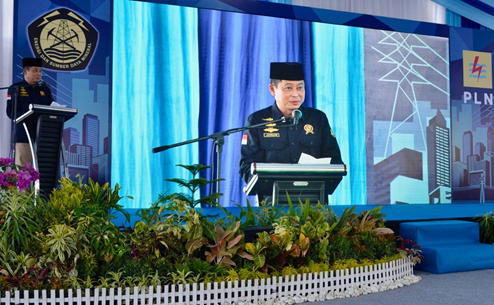 In the inauguration, Minister Jonan said that the presence of this electricity infrastructure is a government effort to provide electricity with a more reliable quality and reduce interference. "Regarding electricity in Aceh, what must be improved is the transmission and distribution system, including the construction of several substations (Gardu Induk) as a means to make the electricity service here more reliable or less disturbing," said Jonan. In addition, Jonan also asked for assistance from the local government to facilitate licensing and land acquisition related to the construction of electricity infrastructure in Aceh Province. "Suppose we need to take care of permits, as well as land procurement, etc. Need help. Because this is for the benefit of the community. Well, if that is all possible, of course the growth of services to the community is expected to be better," said Jonan. Jonan also advised the directors and PLN employees to build infrastructure based on the aim of improving electricity services to the community. "Please colleagues at PLN, whatever the target is one that is built, namely the electricity service for the community is better, that the problem is," he said. 1. 150 kV Takengon substations (1x30 MVA) and 150 kV Takengon - Bireun High Voltage Air Channels (SUTT), with a network length of 73.51 Kms (203 towers). 2. GI 150 kV Subulussalam (1x30 MVA) and SUTT 150 kV Subulussalam - Sidikalang, with a network length of 110.48 Kms. 3. GI 150 kV Kutacane (1 x 30 MVA) and SUTT 150 kV Berastagi - Kutacane, with a network length of 110.48 Kms. From the financial side, the Director General of Electricity, Rida Mulyana, said that with the inclusion of the substations (Gardu Induk) transmission and operation network, PLN could save around Rp. 265.5 billion in one year. Because the presence of the GI and SUTT will close several diesel power plants that have been operating. "With the introduction of the transmission network and the operation of its supporting substations (Gardu Induk), PLN can save approximately Rp. 265.5 billion a year. This is because there are several diesel-based power plants, which are approximately 48.8 megawatts, which will be closed. the main cost of electricity procurement which has also been requested by the Minister and the President, "said Rida. Meanwhile, Task Executor (Plt) Governor of Aceh Nova Iriansyah was convinced that the operation of the electricity system which was inaugurated today, coupled with the construction of electricity infrastructure in other Districts, could increase the reliability of electricity in Aceh Province and improve the development and performance of the Government.